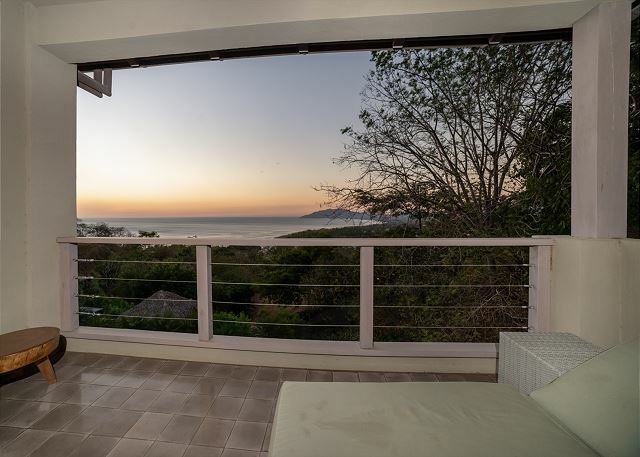 Villa El Estero is one of the 6 luxury homes that compose Villas Las Mareas, an ocean-view paradise located in an exclusive gated community nestled above the estuary on a Tamarindo hillside. 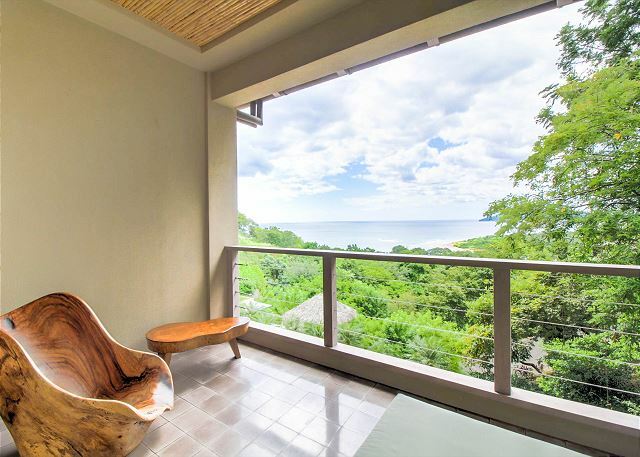 Villas Las Mareas overlooks the looping curves of the estuary as it meets the Pacific in the pristine and protected Las Baulas National Park. 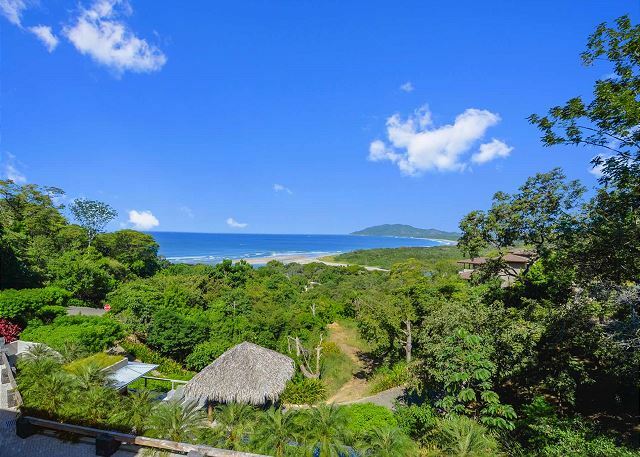 On the beach in front of Villas Las Mareas are the waves that make Tamarindo an international surf destination. 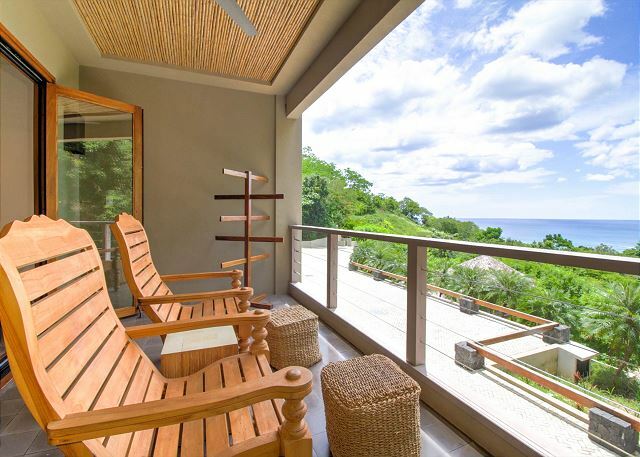 Villas Las Mareas features a private infinity-edge pool and barbeque area that overlook the endless Guanacaste coastline and soul-southing Pacific horizon. First and second floor terraces provide generous space for the outdoor living that you dream of on your tropical vacation. 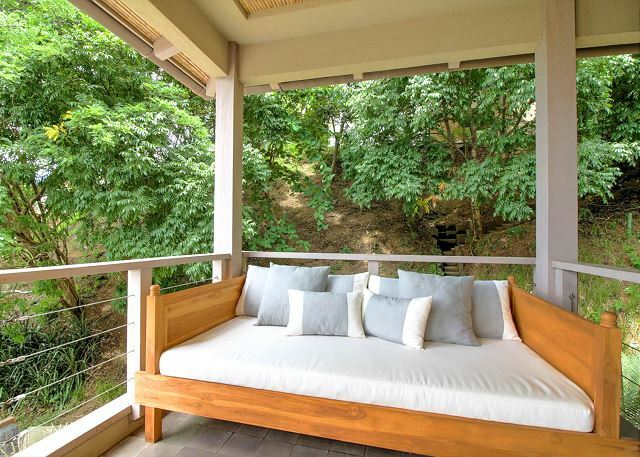 Enjoy a steaming mug of coffee amid the morning birdsong. Check the surf. 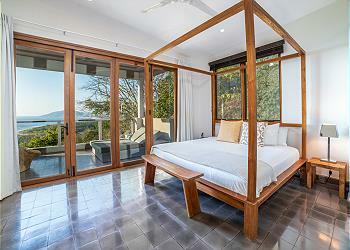 Stretch out on the daybed with your favorite book. In the evening, sip a cooling cocktail with your friends or family while the sun sinks into the sea. 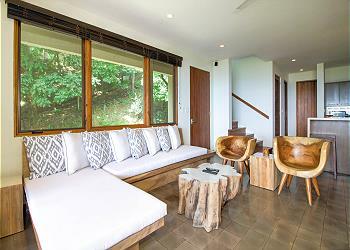 Inside Villa El Estero, over 2,000 square feet of space is elegantly illuminated with natural light, and furnished in a unique Pacific Rim deco style with select local materials that facilitate the indoor/outdoor lifestyle of Costa Rica. The gourmet kitchen is equipped entirely with state-of-the-art Bosch appliances and supplied with everything that makes a kitchen feel like home. 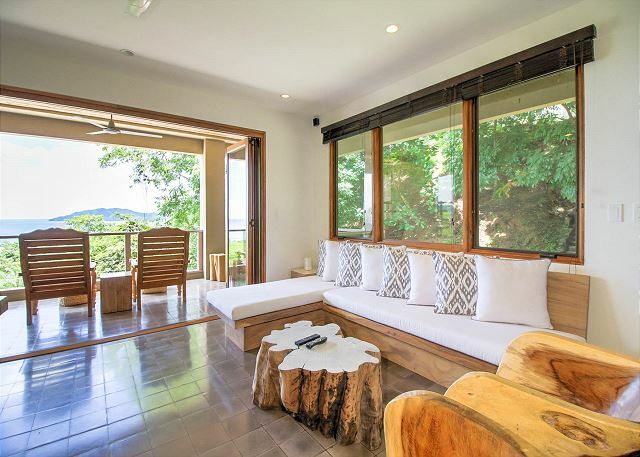 Villa El Estero is unique among the Villas Las Mareas, being the only home that offers 4 bedrooms and can sleep up to 12 guests. 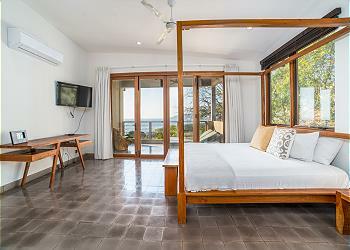 The villa’s master bedroom, with its private second-floor terrace and stunning ocean view, is furnished with a king sized bed. The two guest bedrooms, one on the first floor and one on the second, are each furnished with a king sized bed, and two twin trundle beds are available. An additional ground-level suite in this villa contains a living area with a daybed that converts into 2 twin beds, and a private bedroom that is furnished with a queen sized bed. 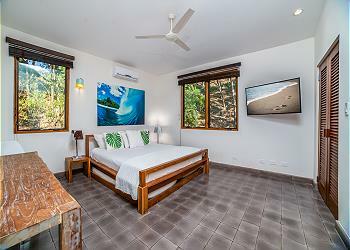 As a guest at Villas Las Mareas, you're just steps from Pangas Restaurant & Beach Club, an innovative Guanacaste fusion restaurant with a full bar and friendly staff, set in the sand where the estuary and ocean meet. And this is just the beginning. 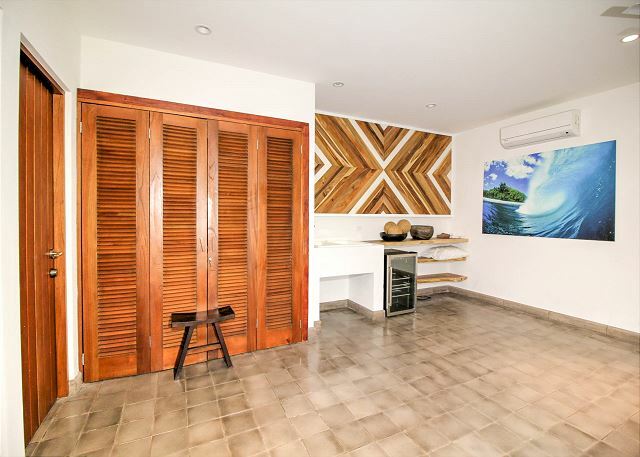 Walk the street or the beach and experience the energy of Tamarindo, this vibrant beach town made famous by its year-round surf, adventure tours and eclectic international community. 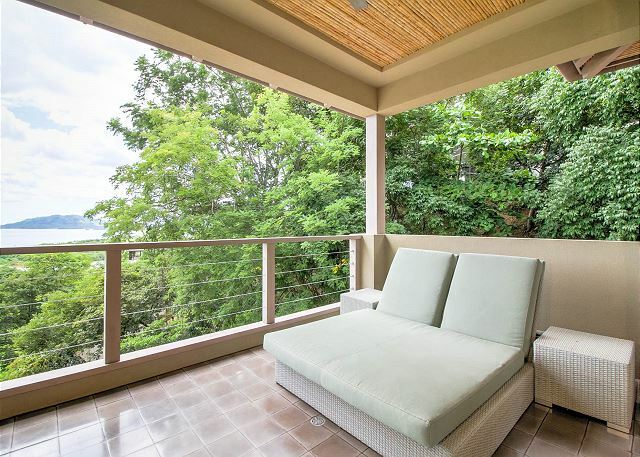 All the excitement of exploring, dining, shopping and nightlife are right in your front yard at Villas Las Mareas. 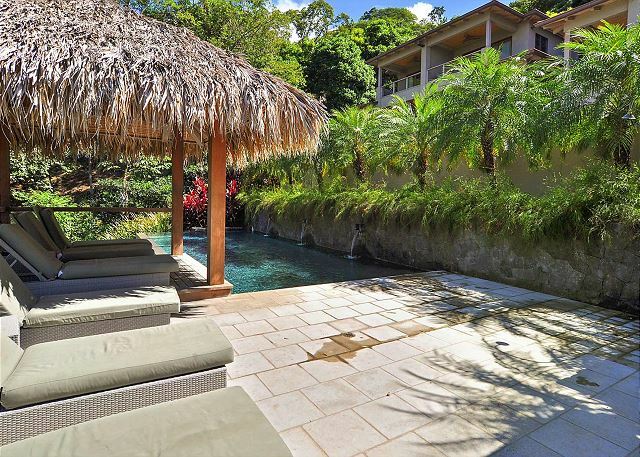 Enjoy them all, and then retreat to the tranquil privacy of Villa El Estero where you feel worlds away from it all. Having the best of both worlds is not only possible, it is ready and waiting. We enjoyed Spring Break by visiting Costa Rica. Tamarindo is a perfect spot to experience much of Costa Rica. Locals were friendly, surf was great, restaurants were plentiful, food was excellent, travel was easy, golf cart rental is a perfect way to get around town. A great time. 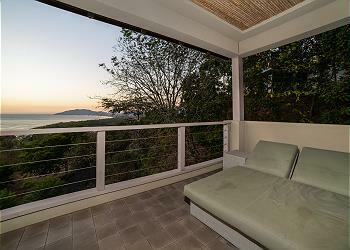 We just had 4 terrific days in Tamarindo, Costa Rica at Las Mareas Villa. 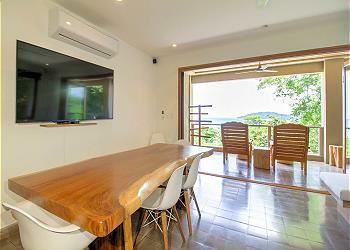 The house was very spacious, clean and had a great view of the ocean. It also is located within two minutes of the heart of Tamarindo, with its many shops, restaurants, taverns and the beach. Thank you so much David! We are happy you had a fantastic vacation during your stay in Las Mareas Villa 1. 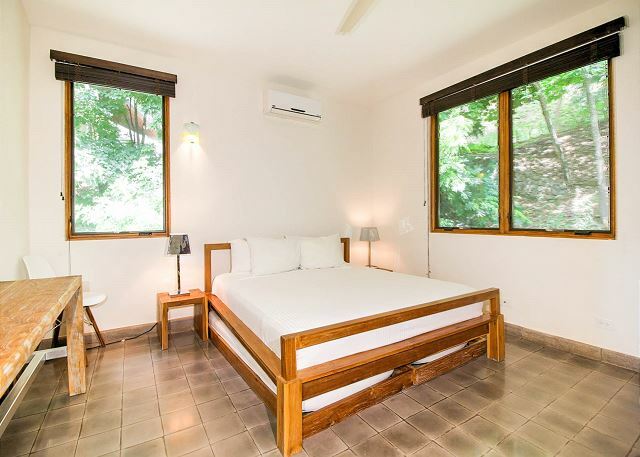 We hope you come back to sunny Tamarindo very soon. Pura Vida! The accommodations were exactly what we were hoping for and allowed our family of nine to experience the best of Tamarindo and the fun of sharing it together. The accommodations were clean, well appointed, in a location that worked well with so many different interests, and Cristina was exceptional in taking care of our every request and inquiry. 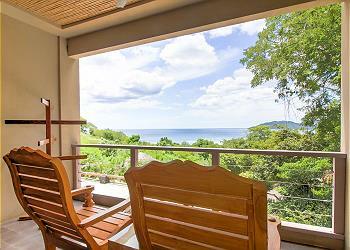 We would highly recommend this Villa to anyone wishing an adventurous and luxurious holiday. Thank you Katherine! 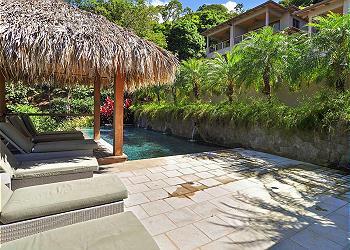 So glad that Las Mareas Villas , Villa 1 and Tamarindo fulfill your expectations for you and your family. It was our pleasure to assist you during your stay and that Cris was able to help you in every inquiry you had :) Thank you for recommending us and hope you come back soon! Wonderful, beautiful place to stay! Excellent place to spend time relaxing and enjoying the lovely views! Really a beautiful home! Thank you for your comments. So happy to hear you loved the Villa and had a great vacation! We had four couples and the place was perfect. We loved the pool with the grill and we used all the verandas. We also had a chef come in and they cooked us the most delicious dinner and a great breakfast one morning. Cris and Adrianne were very helpful with renting a car and scheduling the chef. We walked to the beach every day and the views from the villa were amazing!! Highly recommend. Thank you Annie! 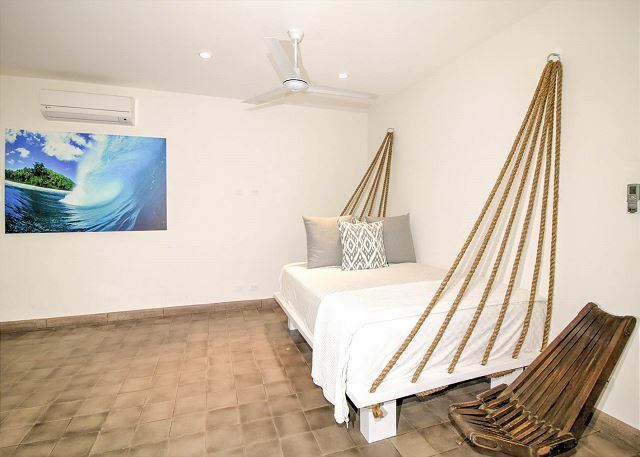 So glad to hear you loved Las Mareas Villas and that is was perfect for your group. It is true the pool area is super nice and a great place for get togethers and BBQ's :-) It was our pleasure to help you before and during your stay and we hope you come back to sunny Tamarindo very soon as we would love to assist you once again! This villa was beyond anything we could have imagined. Very private with an amazing view. Close to beaches, food and so much to do! Our concierge Cris was so awesome!! She handled everything for us and gave us great recommendations.. Can't wait to come back! Thank you Cathey for your review! We are thrilled to hear how much you enjoyed the Villa and its location! Its true it has the perfect view so you can enjoy sunsets from the comfort of your balcony! It was such a pleasure to assist you before and during your stay, specially Cris organizing all your fun adventures. Hope you can make it back to sunny Tamarindo very soon. Pura Vida! Las Mareas Villa 1 was the perfect choice for our vacation. 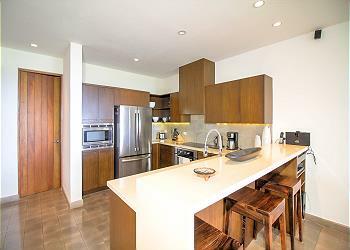 The condo was even better in person than as shown in the online photos. 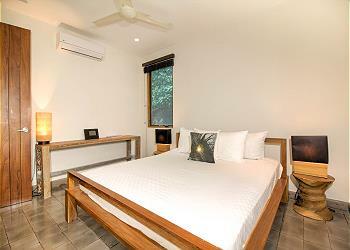 Well appointed, well maintained, lovely furnishings and stunning views. Everyone working for the property management company () were great. Incredibly helpful and willing to do whatever necessary to make our trip an enjoyable on. Thank you Andrea for your kind review! Its great to hear you loved the condo and that you liked it better in person :) It was a pleasure to assist you throughout your trip and we hope you make it back very soon!! Amazing stay at Las Mareas Villa 1. From the minute we booked, the management company provided all the help we needed for a great vacation. Communication was excellent both before and during our stay. We were able to book our tours in advance with the concierge, and they were always willing to answer our questions. A wonderful group of people who made everything easy. The villa had everything we needed for a great stay. 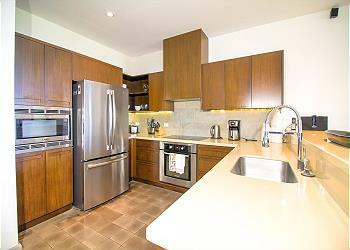 Excellent air conditioning, great washer and dryer, and all the kitchen equipment you would need. We spent a lot of our time on the very large balcony enjoying the amazing view. The pool was wonderful, and had great views as well. The location was quiet, but close enough to town that we could walk to dinner at night. 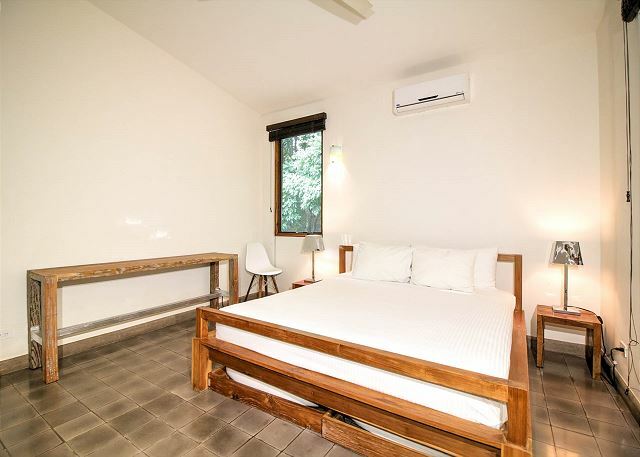 Two things to note when booking this villa. It is up on a hill, which makes for beautiful views but a tough walk back after dinner for those with sub par endurance or mobility issues. We took a cab, which was cheap and easy, but you can also rent golf carts to get around. 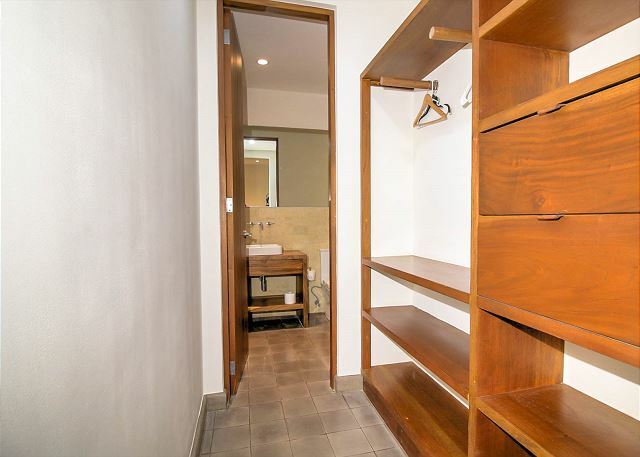 The second thing to note is that the forth bedroom in this unit is accessed through a separate outside entrance on the ground floor, which is something to consider if you plan to use that room for children. We would definitely rent this amazing villa again. Thanks for a great stay! Colleen, Thank you for your review. We are very happy to know you enjoyed your stay and liked the villa! It was a pleasure to have you and help you in everything before and during your stay. 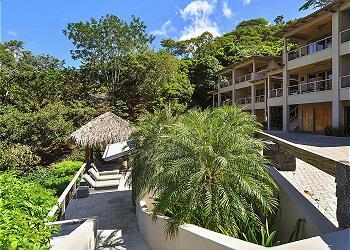 We'd love to help you plan for another great stay when you're ready to come back down to CR. Thank you for staying with us!! My family of 7 rented this Villa while visiting Tamarindo. We were extemely happy with it! 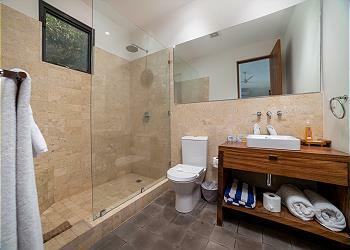 The views were incredible, the villa was modern, beautifully furnished,and very clean. We just could not get enough of the amazing views provided by this rental. The staff also did a great job in arranging excursions. Every driver picking us up for the activities was prompt, courteous and professional. The zip line and ATV tours were great! All the local guides were very professional and friendly. This villa allowed us to walk (although an extremely steep uphill but if you are in good shape you can do it!) into town for all the restaurants which was great. Also, we were very happy to see that Tamarindo beach rented beach chairs and umbrellas as well which made relaxing on the beach great. You can sit on the beach near bars and restaurants so you can eat or drink while relaxing in the sun. The best part of the vacation was the unbelievable sunsets that we viewed from the beach. Overall this rental exceeded our expectations!The only negatives were: The fourth bedroom is a separate unit, with a separate entrance. The hill was hard to walk up twice a day. Lois, We're thrilled to know everything went great with your trip! It was our pleasure assisting you during your vacation. I'm so happy to hear how much you enjoyed the Villa, it is true it has spectacular views. We look forward to welcoming you back for another round very soon, we will be more than happy to assist you! But our favorite was probably the Sunset Sailing Cruise onboard an 82-foot schooner that Cris booked for us. Wow! Live music (thanks Max!) and truly gourmet food, not to mention snorkeling, dancing on the deck, and an open bar. And, Pangas Beach Club is right at the bottom of the hill for dining and fun all week. Me and my family, 8 of us in total had a great time at Las Mareas Villa 1. We were there for 10 days and wasn't long enough. Matt, we are happy to hear you had a great time with your family at Las Mareas. 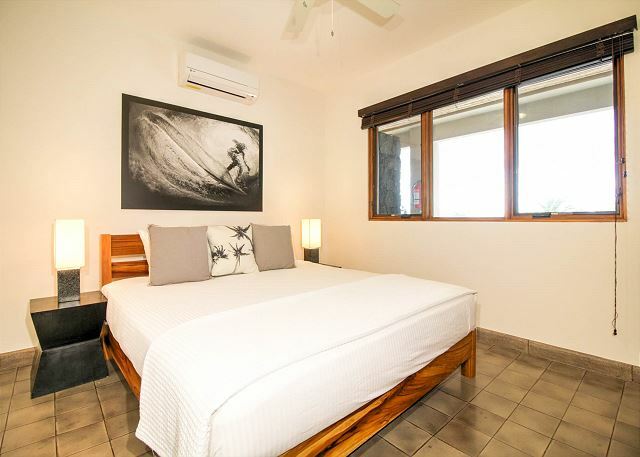 You definitely need to come more often :-) Let us know for your next visit to sunny Tamarindo. Pura Vida! Honestly this is going to be hard, because words can't really express how amazing this place and it's staff were. Everything from day 1 was perfect, the places were clean the staff were super friendly and accommodating especially our two coordinators Adriana Alvarez and Cristina Gonzalez these to girls went over and above for us in every aspect, we never felt like we were bugging them, they were always super friendly and willing to help. The Grounds staff or let's saying cleaning staff for the entire area were amazing and very trust worthy they wouldn't even take out tips when we tried to give it to them we literally had to force them, they kept everything so clean inside and outside. I Highly highly recommend Stay in Tamarindo as a company and Las Mareas as vacation rental I will be going back. "Thank you so much Adam! Sounds like you had an amazing time and really got to enjoy what this area offers! :-) It was a pleasure to assist you throughout your trip and we hope to have you back sometime soon! Pura vida!" The best experience, awesome ocean view, a lot of space, modern appliances and comfortable beds. Amazing trip with my best friends! If you are considering staying in Tamarindo, book this rental! 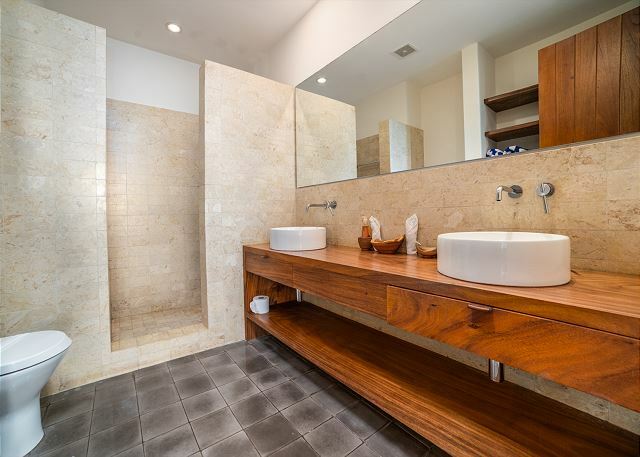 The house was amazing, we went with a group of 7 and it was so nice to have the 4 bedrooms and bathrooms so that every couple had their own space! The main level with the kitchen, living and deck was great and we spent a lot of time in this space enjoying the amazing view of the lagoon! The hill into town is steep, but we all walked it numerous times and it is doable. We also rented a few cheap scooters in town which helped us get around as well! Not to forget the countless hours we spent in the beautiful pool area. The staff is beyond amazing! Cris helped us plan all of our outings and adventures most of which were booked last minute and all were top notch. Also every driver that Cris sent for us were friendly, helpful and accomadating! We will remember this trip forever! Thank you Elizabeth!! Great to know you and your group enjoyed their stay! It was a pleasure to assist you throughout your stay, we'll make sure to pass on your kind comments to Cris, she really does an awesome job every time :-) Pura vida! Exceptional. 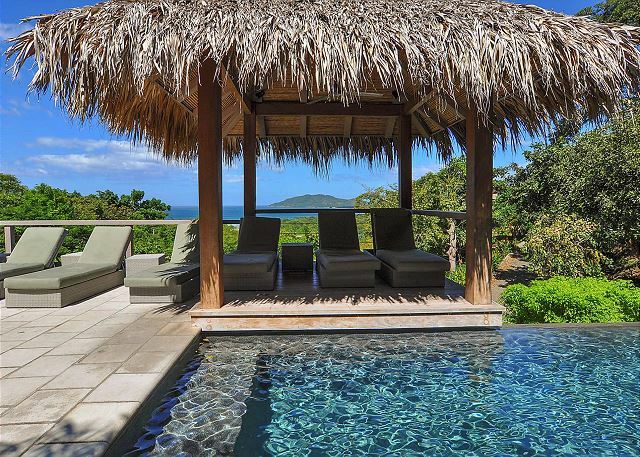 These villas are exceptional in every way. Views, condition, cleanliness, management and location. Would never consider anywhere else in Tamarindo. Thank you Chris!! We loved having you and your family over and hope to have you back soon! Pura vida!! We stayed for one week and had an amazing time! The Villas were beautiful, I would have to say the nicest place I have stayed on vacation. 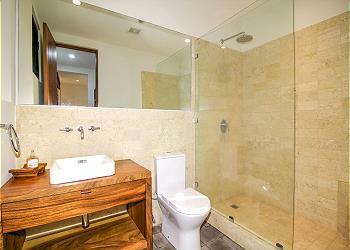 Up to date, nicely furnished, fantastic views, great location. Pool was amazing- quiet, beautiful, many hummingbirds. The management company that worked with us during our stay was wonderful. We used their shuttle service to and from the airport- very easy. We also booked an adventure tour with them and enjoyed that very much. All in all an amazing trip and would love to go back!